Just because we’re having a cookie series doesn’t mean I can skip Fix and Forget Friday…..it just means I have to make cookies IN the crock pot. Brownies and bar cookies always rank really high on my list – especially if they’re gooey in the middle. It is really easy to make brownies in the crock pot – as long as you remember to set a timer and don’t run off and start doing things upstairs where you can’t hear the timer. Ahem. I was afraid these would stick to the bottom of the crock, so I wanted to insure that didn’t happen…..I like insurance. Pull your crock out and lay it on a piece of parchment paper. Trace around the bottom to make a pattern and then cut the pattern out. Lay it down in the bottom of your crock pot. You’d think if I could make patterns like this that I’d be able to cut out a pattern and sew a dress, huh? Now, we need to grease the sides of the crock so that our brownies don’t stick to that either. I used a butter paper from the refrigerator – of course. I’m prepared – I used to be a Girl Scout. 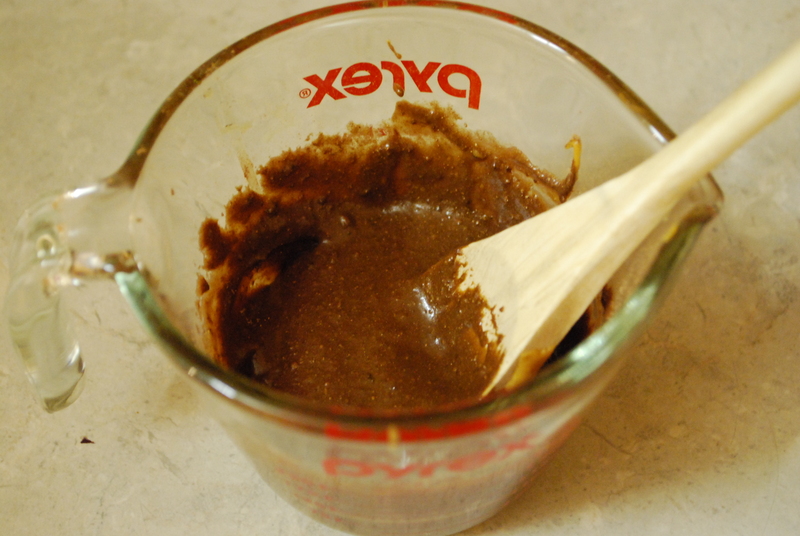 In a small saucepan on the stove combine ½ cup water, 1 stick of butter and 2 tablespoons of cocoa powder. Warm over medium heat until the mixture comes to a boil and the butter melts. You might want to stir pretty often to avoid scorching on the bottom. *Cough* When it boils, remove it from the stove. In a mixing bowl, mix together ½ cup sour cream with 1 egg. Of course, I used a whisk. I have a whisk obsession. Slowly pour in the hot cocoa mixture, stirring constantly. Try to ignore the fact that I’m pouring without stirring. I only have two hands. I’m looking forward to Annie being old enough to take photos. After you get all that mixed together, add 1 cup white wheat flour, 1 cup sucanat, 1 teaspoon baking soda and ¼ teaspoon salt. Mix until no clumps remain. If you’re using a whisk (like you should be) this won’t take long at all. Pour the batter down into your prepared crock. I used a 5 quart crock – it’s my most used size. Spread it evenly and pop the lid on. 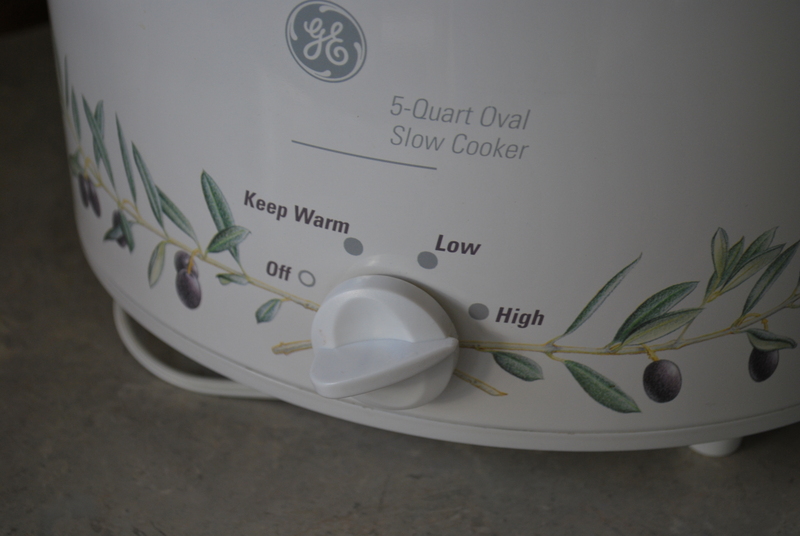 Is it only me, or does everyone else get nervous when turning a crock pot to high? It might as well say “Fire.” Cook for about 1 hour and 20 minutes to 1 ½ hours. How long you bake it depends on the shape of your crock and what size you use. 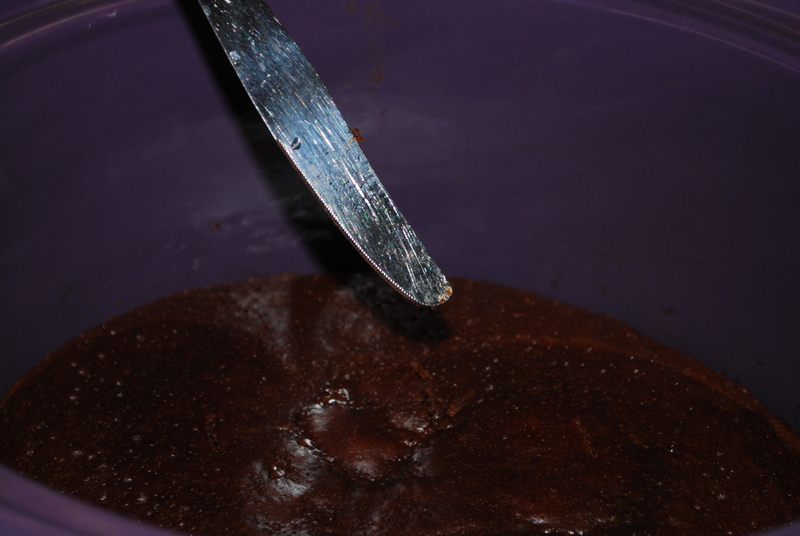 After 1 hour and 20 minutes, test the brownies by inserting a knife in the center. You want it to come out clean, like this. If you open the lid and it still looks battery in the middle…..chances are, it’s not done. Put the lid back on and test again in 20-30 minutes. Test. Repeat. When it’s done, pull the crock out and let it cool. While the brownies are cooling, it’s time to make the frosting. In a small bowl, combine 2 tablespoons of cocoa powder, 2 tablespoons of peanut butter, and 4 tablespoons of maple syrup. Mix well until all the clumps are gone. Stick your finger in there and test the stuff. Groan. Do it again. 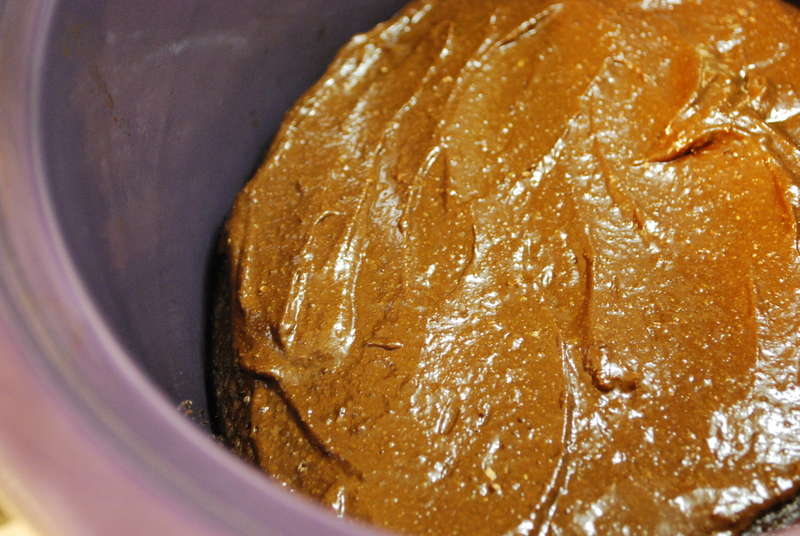 Leave some for the brownies…….frosting for brownies is totally over-rated. Why not just eat it all right now? It’s okay to frost these while they’re still warm…..just don’t do it while they’re still hot or it will melt and make a sauce – like that would be a BAD thing. On second thought, just put the frosting on whenever you want. Hello beautiful! These. Are. Awesome. Really. I could have eaten the entire crock….but that would have been hard to explain to Barry. What was Barry’s verdict? He liked them…..and they sparked a very controversial conversation at bedtime. Barry – That was really good cake. Me – I didn’t make cake. Those were cake BROWNIES. Barry – That was cake, not a brownie. Me – I think I should know it’s a brownie. I DID make them. Barry – What makes it a CAKE brownie? Me – Well, it’s not as thick and it’s a bit more dense than cake. Barry – It was chocolate cake. Barry – I’m sure looking forward to more of that cake tomorrow. Me – Cake? Where is there cake? Barry – In the kitchen. Me – Did you make a cake today? I didn’t see it. Using your crock, trace a pattern of the bottom on a piece of parchment paper. 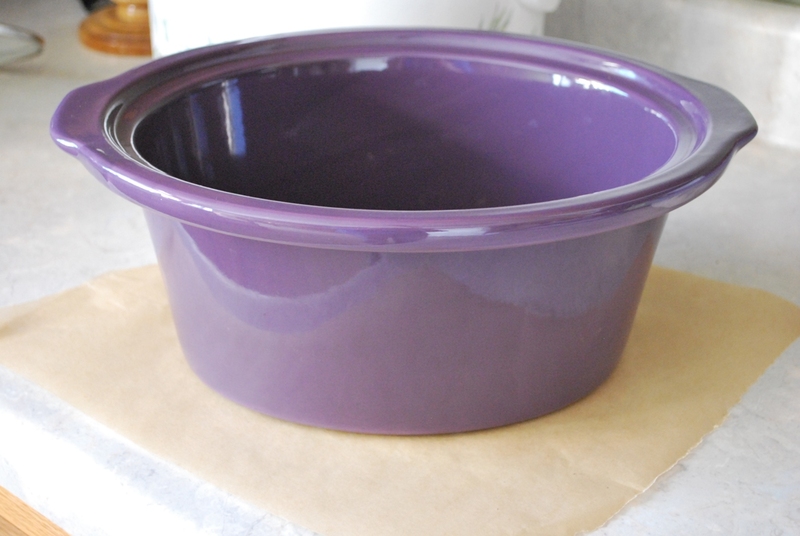 Cut the pattern out and place in the bottom of your crock (use a 5 quart crock if possible). Grease the sides of the crock. 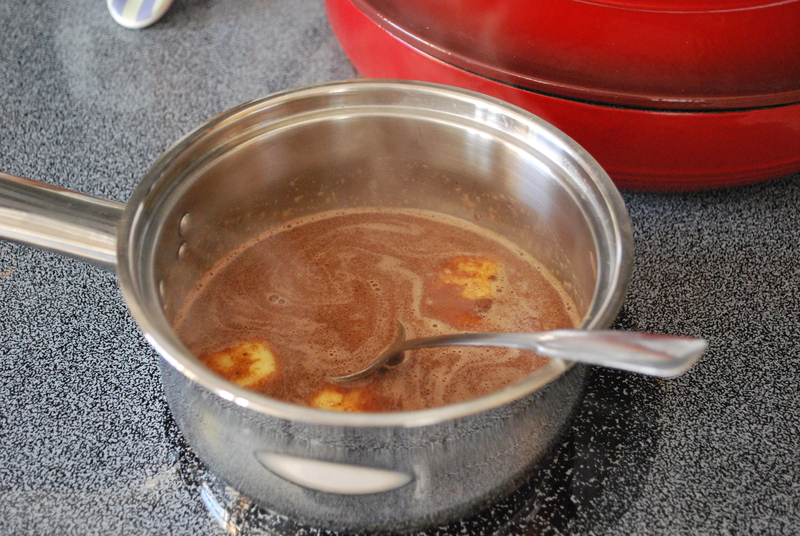 In a small saucepan, combine butter, water, and cocoa powder until mixture comes to a boil and the butter melts. Remove from heat. In a mixing bowl, whisk together sour cream and egg. 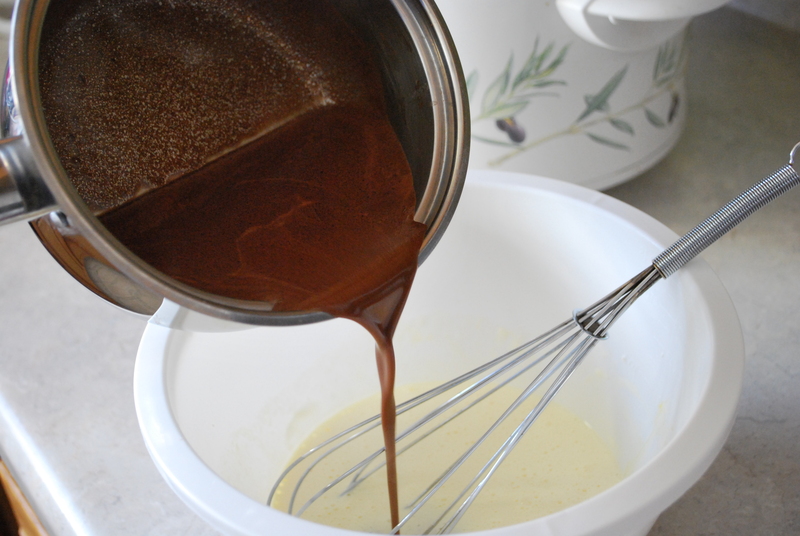 Slowly pour in the cocoa mixture – stirring constantly. Add flour, sucanat, baking soda, and salt. Stir until all lumps are gone. Pour batter down into prepared crock. Cover and cook on HIGH for 1 hour and 20 minutes to 1 ½ hours. Begin testing at the smaller time – insert knife in the center to see if brownies are done (no need to test if it’s still visibly gooey in the middle). Add time accordingly. 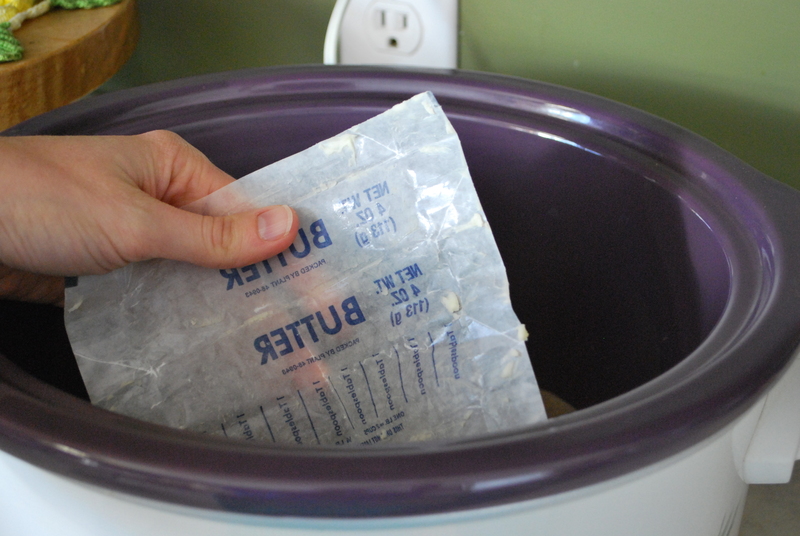 Remove crock from crock pot and cool. 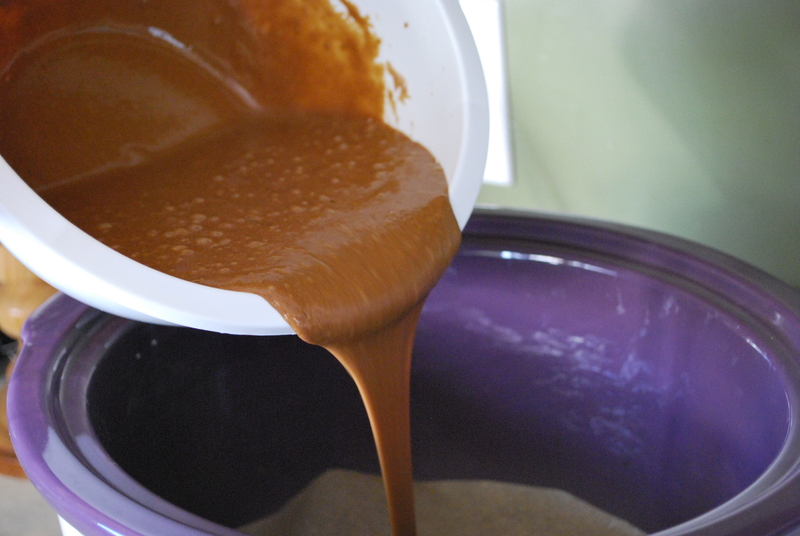 In a small mixing bowl, combine cocoa powder, peanut butter, and maple syrup. Stir until smooth. Spread on top of brownies. Devour. Lick the frosting bowl. This post is linked at Hearth and Soul Blog Hop at Penniless Parenting. I just printed this out and will make it tomorrow. Thank you so much! Whether it is brownies or a cake, it looks delicious! Thank you for sharing this recipe with the Hearth and Soul Hop. Watering for brownies…..right?? 🙂 BROWNIES! That frosting recipe is totally awesome! I’m going to have to try it sometime! 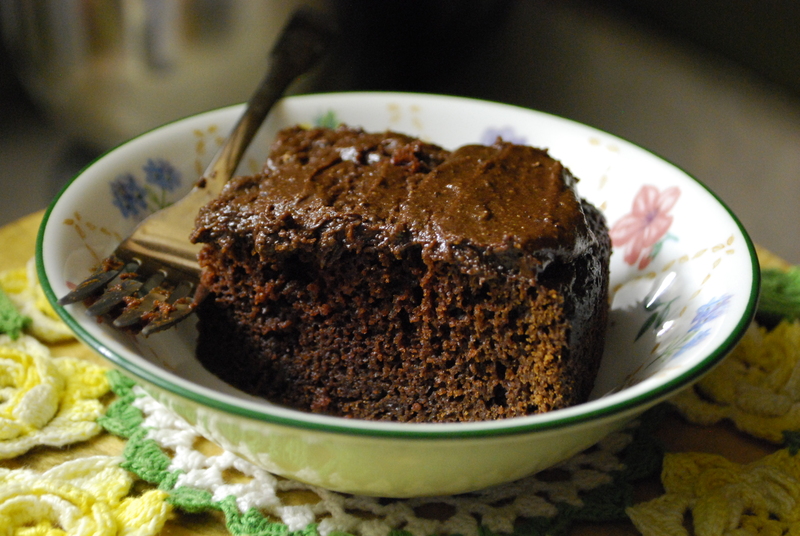 And great idea to make cake in the crock pot. I mean brownies. BROWNIES!!!!!! 🙂 And yes, it’s a great frosting. It’s my “go to” now.